I had all the intentions of sharing an ice cream recipe today, and yet I had no motivation to photograph it (I did have motivation to eat it)! So instead, I’m sharing with you a delicious and easy-to-make grilled chicken recipe. 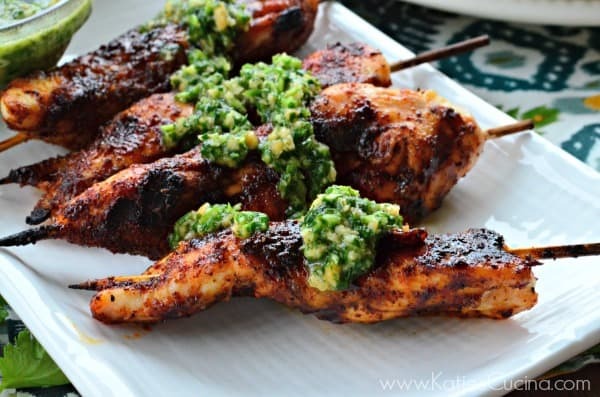 In fact, if your still trying to decide what you want to make today for your Independence day cookout, this recipe for Chili Chicken Skewers with Cilantro Lime Pesto just might be what you were looking for. 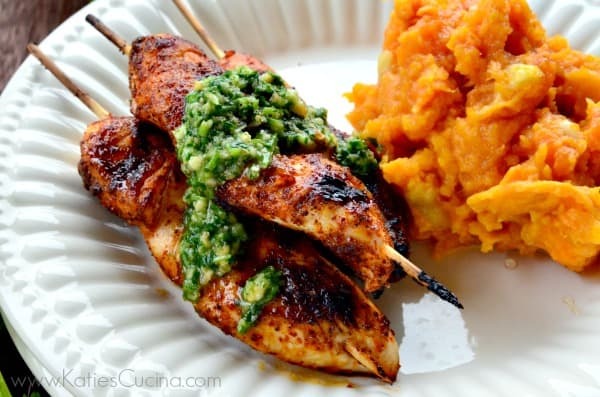 This recipe for Chili Chicken Skewers w/ Cilantro Lime Pesto pairs beautifully with the Mashed Sweet Potatoes & Banana recipe I posted the other day. Since having Ryder, I’ve been eating a whole heck of a lot more meat. We could go one month and consume 12 chicken breast between the two of us (mainly my husband eating the meat). But now I feel the urge to eat meat daily–I guess my body needs the protein. We eat chicken just about every night, although on occasion I throw in a nice roast, or grill a london broil, or pork tenderloin. I’m constantly trying to come up with new chicken recipes. I love skewering just about anything I can throw on the grill. Not sure what it is, but I love it, and I love to grill. Like every day I grill dinner (or just about). This recipe for Grilled Chili Chicken Skewers with Cilantro Lime Pesto is perfect for a quick week night meal. Or maybe you’re entertaining this weekend (or in the coming weeks) and want something different. Something to “wow” your guest. This recipe I have a feeling will wow them. I never think to use cilantro in pesto, but when I have limited ingredients on hand and a crying newborn I use what I have. The cilantro and lime are bright and give these chicken skewers even more depth than I ever could have imagine. It’s almost like a chimichurri sauce in a way! 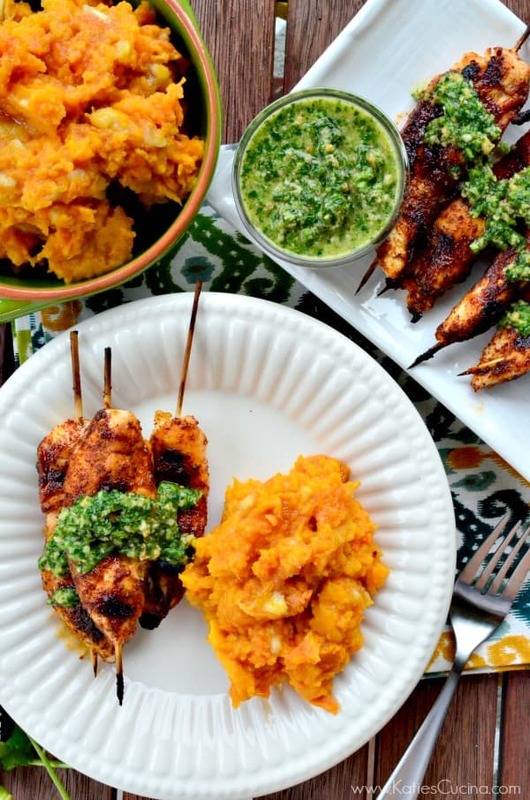 Pair these Grilled Chili Chicken Skewers with Cilantro Lime Pesto with Mashed Sweet Potatoes & Banana for a complete meal! In a bowl, mix together brown sugar, chili powder, salt, and pepper. Rinse and pat dry chicken. 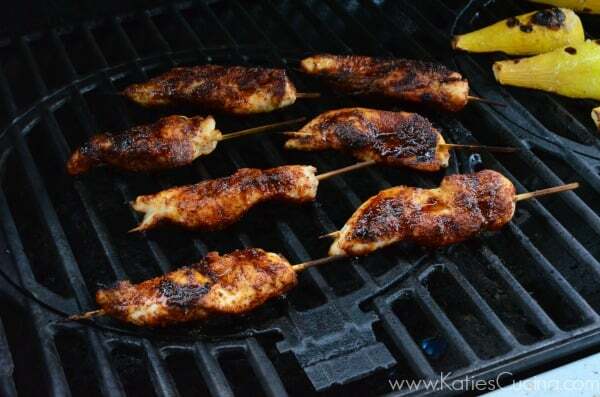 Skewer chicken, drizzle olive oil over the chicken and sprinkle rub over chicken. Massage the rub into the chicken. Place chicken skewers on grill. Cook 10 minutes (flipping once) on medium-low flame until internal temperature reaches 165 degrees Fahrenheit. Once done cooking, remove from heat and set to the side. While the chicken is cooking, place the cilantro, parsley, honey roasted peanuts, lime juice, garlic cloves, olive oil, salt and pepper in a food processor. Puree for 20-30 seconds until all the ingredients are well incorporated and broken down. Refrigerate the Cilantro Lime Pesto until ready to serve. 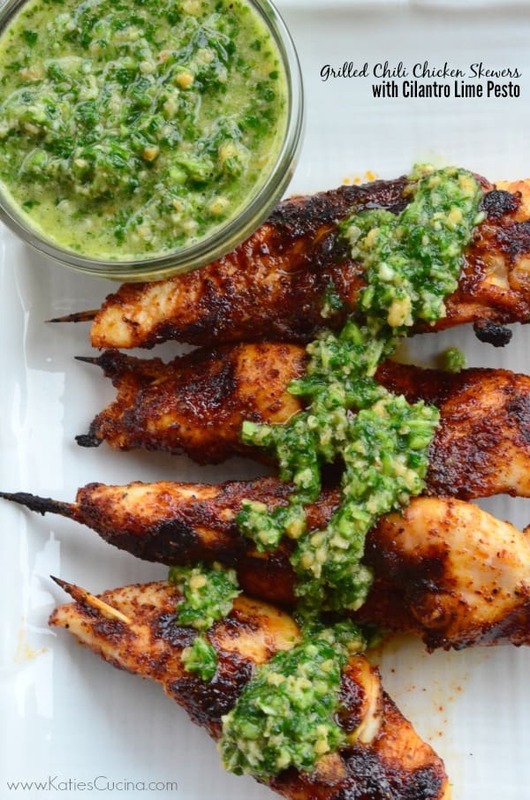 Serve Cilantro Lime Pesto on top of the Grilled Chili Chicken Skewers. *Soak wooden skewers for 30 minutes or longer to avoid skewers from burning. Mmmmm, this looks like the perfect summer meal. Hope you had a wonderful 4th! Thanks Stephanie–we are all for grilling during the summer months. The 4th was great… hope yours was nice as well! Looks amazing. Do you think I can make the Pesto ahead of time, like a day or two before? We are going to a cottage without a blender or food processor and I would love to make this for one of our meals. Celina, I think you can, but keep in mind that the pesto might change color to a darker more dull looking green color. Enjoy! Hi! For how long can I keep this in the fridge? My mother’s party is in two days, but I am planning to prepare this tonight. Thanks! Hi Len, I’m not sure how it will keep after 2 days in the fridge. Are you going to cook them tonight and serve them in two days or just have them marinate? This is the long lost menu and recipes from Cuisine at Home magazine I’ve been searching for! Right down to the banana mashed sweet potatoes. Thanks for posting. I used to make that cilantro pesto a lot…looks like you changed up the recipe slightly. Yum! Lol Deb, I’m so glad I could help. Every now and then I try a recipe that is so good I have to share with others even if it isn’t my own! I’m so glad you found it! I have to make this recipe again. Thank you for posting this tasty recipe. I wanted to copy it in my files after making it from Cuisine at Home. It’s easy, healthy and so tasty. Pingback: 23 Delicious Skewers To Make This Summer - Do You Still Hate Me?